Printed in Italy on the finest silk, these exquisite color photo reproductions give personality and style to your custom jacket and are delivered in 4‑5 weeks. Tell your story with a personalized suit or sport jacket lining from your own photo archives. Finding the right photos is critical to enjoying your Inside Story lining, pocket square or scarf. What works best for custom lining reproduction? A collage of your favorite photos that we can produce from your collection. High resolution images, 1 MGB or larger, 300 DPI. When sending photos from your Smart Phone, send Actual Size, 1 MGB or larger. Pocket squares and scarves also work well with single images and collages. Scale accordingly, sizes vary. 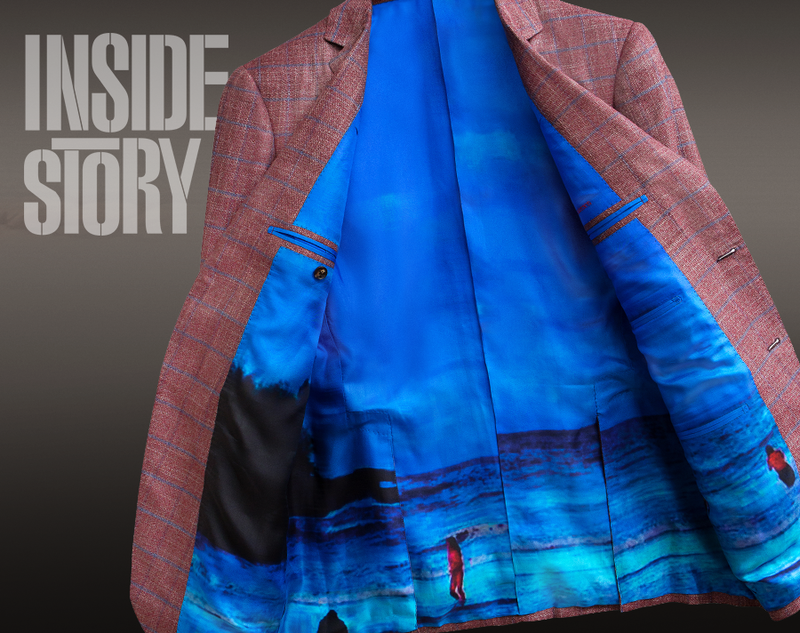 Inside Story uses your digital images to treasure those major milestones in a lining, a pocket square or a scarf. It’s great for wedding parties; anniversaries and birthdays; family and friends; pets; hobbies; sports; schools, clubs and associations; vacations, cruises, trips - anything that is important to you and yours. Inside Story products look best when printed from very high resolution image files (over 3 MGB and 300 DPI). Images from your computer, Smart Phone or tablet may appear sharp, but in actuality they are very low resolution and cannot be enlarged. Inside Story is not responsible for images that are reproduced from low resolution files.